In an effort to take advantage of all the lovely squash in the stores right now, as well as to start liking Bon Appetit magazine again (they changed their fonts and photos last year, and I can’t stand it), I zeroed in on a recipe for Creamy Pumpkin and Cashew Curry. One of the things I like about the layout over at Epicurious is that readers get to review the recipes. So, after taking a look at those reviews, I tweaked the recipe a bit to suit our tastes. Because of a well-stocked Asian market in my area, I was able to find curry leaves and use them for the very first time. To my surprise, they taste like curry, even though they smell nothing like it! Some of the Epicurious readers substituted curry powder for the leaves, so you may want to take that approach if you can’t find them in a store. Additionally, I used kabocha squash, and I eliminated the coconut cream and stuck with coconut milk, instead. Result? We LOVED this curry. It was flavorful, rich-tasting, with just the right amount of heat. I served it over brown rice, and even the puppies loved getting a nugget or two of the squash! Wendy at Pink Stripes is having a pumpkin week going on, and she also made this curry, so you may want to stop by. Recipe after the jump. Microwave, bake, or steam squash until it has softened a lot, but is still resistant to a fork inserted in it. You will be cooking it some more, so don’t over cook it at this stage or it will turn to mush. Heat 1 tablespoon oil in large skillet over medium heat. Add pumpkin and cook until golden, stirring occasionally, 8 to 10 minutes. Transfer to bowl. Add 1 tablespoon oil to same skillet. Add mustard seeds and curry leaves; cook until seeds pop and leaves sizzle, 30 seconds. Add onions, garlic, and ginger. Sauté until onions are golden, 4 minutes. Add chiles, cashews, turmeric, and cumin; stir-fry 1 minute. Add coconut milk. Increase heat to medium high. Boil gently until thickened, 2 minutes. Be careful here and don’t let it boil like crazy, or it can curdle. Return pumpkin to pan; reduce heat to medium. Simmer until pumpkin is tender, 4 minutes. Stir in 1/2 cup cilantro and lime juice. Spoon over rice; garnish with additional cilantro. * Sold at specialty foods stores, Indian and Asian markets, and adrianascaravan.com. If unavailable, use brown mustard seeds. ** Also known as kari patta; available at Indian markets. *** Thin, red, hot three-inch-long chiles; available at some supermarkets and at specialty foods stores and Latin markets. **** Available at supermarkets and at Indian, Southeast Asian, and Latin markets. 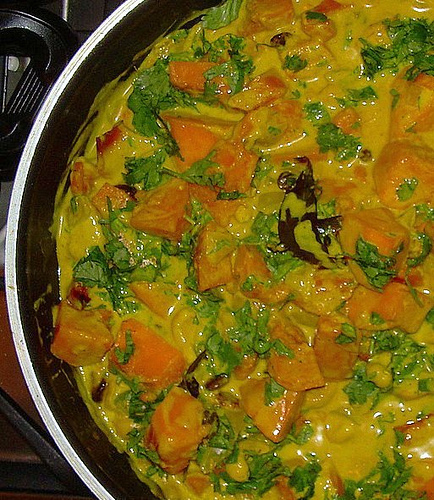 Yum, what a great idea to make curry out of pumpkin! WOW! I am in love with this dish! Those flavors are gorgeous and I love the combination of curry and pumpkin (I just tried it a couple of weeks ago and flipped over it!) Gorgeous dish! Glad you liked it. Great choice on leaving out the coconut cream. it made it too sweet.